"FC Internazionale Milano", "Internazionale", and "Internazionale Milano" redirect here. For other uses, see Internazionale (disambiguation). Football Club Internazionale Milano, commonly referred to as Internazionale (pronounced [ˌinternattsjoˈnaːle]) or simply Inter and colloquially known as Inter Milan outside Italy, is an Italian professional football club based in Milan, Lombardy. Inter is the only Italian club to have never been relegated from the top flight. Inter has won 30 domestic trophies on par with its local rivals A.C. Milan, including 18 league titles, 7 Coppa Italia and 5 Supercoppa Italiana. From 2006 to 2010, the club won five successive league titles, equalling the all-time record at that time. They have won the Champions League three times: two back-to-back in 1964 and 1965 and then another in 2010. Their latest win completed an unprecedented Italian seasonal treble, with Inter winning the Coppa Italia and the Scudetto the same year. The club has also won three UEFA Cups, two Intercontinental Cups and one FIFA Club World Cup. Inter's home games are played at the San Siro stadium, also known as the Stadio Giuseppe Meazza. Shared with rival A.C. Milan, the stadium is the largest in Italian football with a capacity of 80,018. The local team A.C. Milan are considered among their biggest rivals, and matches between the two teams, known as the Derby della Madonnina, are one of the most followed derbies in football. As of 2010[update], Inter is the second-most supported team in Italy, and the sixth most-supported team in Europe. [nb 1] The club is one of the most valuable in Italian and world football. It was a founding member of the now-defunct G-14 group of Europe's leading football clubs. This wonderful night bestows us with the colours of our crest: black and azure against a gilded backdrop of stars. It shall be called International, because we are brothers of the world. In 1922, Inter remained in the top league after winning two play-offs. 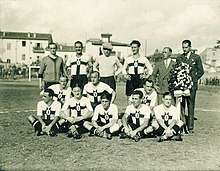 Six years later, during the Fascist era, the club was forced to merge with the Unione Sportiva Milanese and was renamed Società Sportiva Ambrosiana. The team wore white jerseys during this time with a red cross emblazoned on it. The jersey's design was inspired by the flag and coat of arms of the city of Milan. In 1929, club chairman Oreste Simonotti changed the club's name to Associazione Sportiva Ambrosiana, however supporters continued to call the team Inter, and in 1931 new chairman Pozzani caved in to shareholder pressure and changed the name to Associazione Sportiva Ambrosiana-Inter. In 1960, manager Helenio Herrera joined Inter from Barcelona, bringing with him his midfield general Luis Suárez, who won the European Footballer of the Year in the same year for his role in Barcelona's La Liga/Fairs Cup double. He would transform Inter into one of the greatest teams in Europe. He modified a 5–3–2 tactic known as the "Verrou" ("door bolt") which created greater flexibility for counterattacks. The catenaccio system was invented by an Austrian coach, Karl Rappan. Rappan's original system was implemented with four fixed defenders, playing a strict man-to-man marking system, plus a playmaker in the middle of the field who plays the ball together with two midfield wings. Herrera would modify it by adding a fifth defender, the sweeper or libero behind the two centre backs. The sweeper or libero who acted as the free man would deal with any attackers who went through the two centre backs. Inter finished third in the Serie A in his first season, second the next year and first in his third season. Then followed a back-to-back European Cup victory in 1964 and 1965, earning him the title "il Mago" ("the Wizard"). The core of Herrera's team were the attacking fullbacks Tarcisio Burgnich and Giacinto Facchetti, Armando Picchi the sweeper, Suárez the playmaker, Jair the winger, Mario Corso the left midfielder, and Sandro Mazzola, who played on the inside-right. 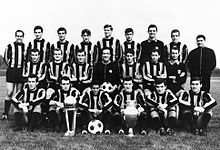 In 1964, Inter reached the European Cup Final by beating Borussia Dortmund in the semi-final and Partizan in the quarter-final. In the final, they met Real Madrid, a team that had reached seven out of the nine finals to date. Mazzola scored two goals in a 3–1 victory, and then the team won the Intercontinental Cup against Independiente. A year later, Inter repeated the feat by beating two-time winner Benfica in the final held at home, from a Jair goal, and then again beat Independiente in the Intercontinental Cup. Led by the German duo of Andreas Brehme and Lothar Matthäus, and Argentine Ramón Díaz, Inter captured the 1989 Serie A championship. Inter were unable to defend their title despite adding fellow German Jürgen Klinsmann to the squad and winning their first Supercoppa Italiana at the start of the season. With Massimo Moratti's takeover from Ernesto Pellegrini in 1995, Inter twice broke the world record transfer fee in this period (£19.5 million for Ronaldo from Barcelona in 1997 and £31 million for Christian Vieri from Lazio two years later). However, the 1990s remained the only decade in Inter's history in which they did not win a single Serie A championship. For Inter fans, it was difficult to find who in particular was to blame for the troubled times and this led to some icy relations between them and the chairman, the managers and even some individual players. Moratti later became a target of the fans, especially when he sacked the much-loved coach Luigi Simoni after only a few games into the 1998–99 season, having just received the Italian manager of the year award for 1998 the day before being dismissed. That season, Inter failed to qualify for any European competition for the first time in almost ten years, finishing in eighth place. Inter's misfortunes continued the following season, losing the 2000 Supercoppa Italiana match against Lazio 4–3 after initially taking the lead through new signing Robbie Keane. They were also eliminated in the preliminary round of the Champions League by Swedish club Helsingborgs IF, with Álvaro Recoba missing a crucial late penalty. Lippi was sacked after only a single game of the new season following Inter's first ever Serie A defeat to Reggina. Marco Tardelli, chosen to replace Lippi, failed to improve results, and is remembered by Inter fans as the manager that lost 6–0 in the city derby against Milan. Other members of the Inter "family" during this period that suffered were the likes of Vieri and Fabio Cannavaro, both of whom had their restaurants in Milan vandalised after defeats to the Rossoneri. In 2002, not only did Inter manage to make it to the UEFA Cup semi-finals, but were also only 45 minutes away from capturing the Scudetto when they needed to maintain their one-goal advantage away to Lazio. Inter were 2–1 up after only 24 minutes. Lazio equalised during first half injury time and then scored two more goals in the second half to clinch victory that eventually saw Juventus win the championship. The next season, Inter finished as league runners-up and also managed to make it to the 2002–03 Champions League semi-finals against Milan, losing on the away goals rule. On 8 July 2004, Inter appointed former Lazio coach Roberto Mancini as its new head coach. In his first season, the team collected 72 points from 18 wins, 18 draws and only two losses, as well as winning the Coppa Italia and later the Supercoppa Italiana. On 11 May 2006, Inter retained their Coppa Italia title once again after defeating Roma with a 4–1 aggregate victory (a 1–1 scoreline in Rome and a 3–1 win at the San Siro). Inter were awarded the 2005–06 Serie A championship retrospectively after points were stripped from Juventus and Milan due to the match fixing scandal that year. During the following season, Inter went on a record-breaking run of 17 consecutive victories in Serie A, starting on 25 September 2006 with a 4–1 home victory over Livorno, and ending on 28 February 2007, after a 1–1 draw at home to Udinese. On 22 April 2007, Inter won their second consecutive Scudetto—and first on the field since 1989—when they defeated Siena 2–1 at Stadio Artemio Franchi. Italian World Cup-winning defender Marco Materazzi scored both goals. Inter started the 2007–08 season with the goal of winning both Serie A and Champions League. The team started well in the league, topping the table from the first round of matches, and also managed to qualify for the Champions League knockout stage. However, a late collapse, leading to a 2–0 defeat with ten men away to Liverpool on 19 February in the Champions League, threw into question manager Roberto Mancini's future at Inter while domestic form took a sharp turn of fortune with the team failing to win in the three following Serie A games. After being eliminated by Liverpool in the Champions League, Mancini announced his intention to leave his job immediately only to change his mind the following day. On the final day of the 2007–08 Serie A season, Inter played Parma away, and two goals from Zlatan Ibrahimović sealed their third consecutive championship. Mancini, however, was sacked soon after due to his previous announcement to leave the club. 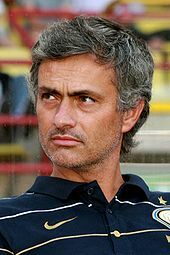 On 2 June 2008, Inter appointed former Porto and Chelsea boss José Mourinho as new head coach. In his first season, the Nerazzurri won a Suppercoppa Italiana and a fourth consecutive title, though falling in the Champions League in the first knockout round for a third-straight year, losing to eventual finalist Manchester United. In winning the league title Inter became the first club in the last 60 years to win the title for the fourth consecutive time and joined Torino and Juventus as the only clubs to accomplish this feat, as well as being the first club based outside Turin. Inter enjoyed more success in the 2009–10 Champions League, defeating reigning champions Barcelona in the semi-final, and then beating Bayern Munich 2–0 in the final with two goals from Diego Milito. Inter also won the 2009–10 Serie A title by two points over Roma, and the 2010 Coppa Italia by defeating the same side 1–0 in the final. This made Inter the first Italian team to win Treble. At the end of the season, Mourinho left the club to manage Real Madrid; he was replaced by Rafael Benítez. On 21 August 2010, Inter defeated Roma 3–1 and won the 2010 Supercoppa Italiana, their fourth trophy of the year. In December 2010, they claimed the FIFA Club World Cup for the first time after a 3–0 win against TP Mazembe in the final. However, after this win, on 23 December 2010, due to their declining performance in Serie A, the team fired Benítez. He was replaced by Leonardo the following day. Leonardo started with 30 points from 12 games, with an average of 2.5 points per game, better than his predecessors Benítez and Mourinho. 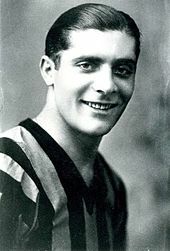 On 6 March 2011, Leonardo set a new Italian Serie A record by collecting 33 points in 13 games; the previous record was 32 points in 13 games made by Fabio Capello in the 2004–05 season. Leonardo led the club to the quarter-finals of the Champions League before losing to Schalke 04, and lead them to Coppa Italia title. At the end of the season, however, he resigned and was followed by not-so-successful new managers Gian Piero Gasperini, Claudio Ranieri and Andrea Stramaccioni. On 1 August 2012, the club announced that Moratti was to sell a minority interest of the club to a Chinese consortium led by Kenneth Huang. On the same day, Inter announced an agreement was formed with China Railway Construction Corporation Limited for a new stadium project, however, the deal with the Chinese eventually collapsed. The 2012–13 season was the worst in recent club history with Inter finishing ninth in Serie A and failing to qualify for any European competitions. Walter Mazzarri was appointed to replace Stramaccioni on 24 May 2013. On 15 October 2013, an Indonesian consortium (International Sports Capital HK Ltd.) led by Erick Thohir, Handy Soetedjo and Rosan Roeslani, signed an agreement to acquire 70% of Inter shares from Internazionale Holding S.r.l. Immediately after the deal, Moratti's Internazionale Holding S.r.l. still retained 29.5% of the shares of FC Internazionale Milano S.p.A. After the deal, the shares of Inter was owned by a chain of holding companies, namely International Sports Capital S.p.A. of Italy (for 70% stake), International Sports Capital HK Limited and Asian Sports Ventures HK Limited of Hong Kong. Asian Sports Ventures HK Limited, itself another intermediate holding company, was owned by Nusantara Sports Ventures HK Limited (60% stake, a company owned by Thohir), Alke Sports Investment HK Limited (20% stake) and Aksis Sports Capital HK Limited (20% stake). Thohir, whom also co-owned Major League Soccer (MLS) club D.C. United and Indonesia Super League (ISL) club Persib Bandung, announced on 2 December 2013 that Inter and D.C. United had formed strategic partnership. During the Thohir era the club began to modify its financial structure from one reliant on continual owner investment to a more self sustain business model although the club still breached UEFA Financial Fair Play Regulations in 2015. The club was fined and received squad reduction in UEFA competitions, with additional penalties suspended in the probation period. During this time, Roberto Mancini returned as coach on 14 November 2014. On 6 June 2016, Suning Holdings Group (via a Luxembourg-based subsidiary Great Horizon S.á r.l.) a company owned by Zhang Jindong, co-founder and chairman of Suning Commerce Group, acquired a majority stake of Inter from Thohir's consortium International Sports Capital S.p.A. and from Moratti family's remaining shares in Internazionale Holding S.r.l. According to various filings, the total investment from Suning was around €270 million. The deal was approved by an extraordinary general meeting on 28 June 2016, from which Suning Holdings Group had acquired a 68.55% stake in the club. The first season of new ownership, however, started with poor performance in pre-season friendlies. On 8 August 2016, Inter parted company with head coach Roberto Mancini by mutual consent over disagreements regarding the club's direction. He was replaced by Frank de Boer who was sacked on 1 November 2016 after leading Inter to a 4W–2D–5L record in 11 Serie A games as head coach. The successor, Stefano Pioli, didn't save the team from getting the worst group result in UEFA competitions in the club's history. Despite an eight-game winning streak, he and the club parted away before season's end when it became clear they would finish outside the league's top three for the sixth consecutive season. 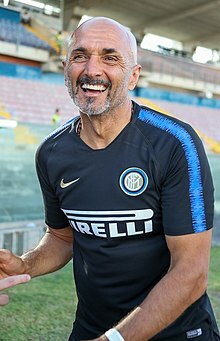 On 9 June 2017, former Roma coach Luciano Spalletti was appointed as Inter manager, signing a two-year contract and eleven months later Inter clinched a UEFA Champions League group stage spot after going six years without Champions League participation thanks to a 3–2 victory against Lazio in the season finale of 2017–18 Serie A. On 26 October 2018, Steven Zhang was appointed as new president of the club. On 25 January 2019, the club officially announced that LionRock Capital from Hong Kong reached an agreement with International Sports Capital HK Limited, in order to acquire its 31.05% shares in Inter and to become the club's new minority shareholder. One of the founders of Inter, a painter named Giorgio Muggiani, was responsible for the design of the first Inter logo in 1908. The first design incorporated the letters "FCIM" in the centre of a series of circles that formed the badge of the club. The basic elements of the design have remained constant even as finer details have been modified over the years. Starting at the 1999–2000 season, the original club crest was reduced in size, to give place for the addition of the club's name and foundation year at the upper and lower part of the logo respectively. In 2007, the logo was returned to the pre-1999–2000 era. It was given a more modern look with a smaller Scudetto star and lighter color scheme. This version was used until July 2014, when the club decided to undertake a rebranding. The most significant difference between the current and the previous logo is the omission of the star from other media except match kits. 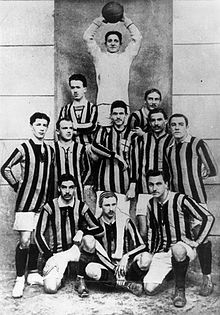 Since its founding in 1908, Inter have worn black and blue stripes. It is rumoured that black was chosen to represent night and blue was chosen to represent the sky. Aside from a short period during World War II, Inter continued to wear the black and blue stripes, earning them the nickname Nerazzurri. 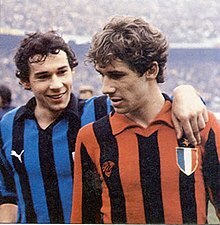 For a period of time, however, Inter were forced to abandon their black and blue uniforms. In 1928, Inter's name and philosophy made the ruling Fascist Party uneasy. As a result, during the same year the 20-year-old club was merged with Unione Sportiva Milanese. The new club was named Società Sportiva Ambrosiana after the patron saint of Milan. The flag of Milan (the red cross on white background) replaced the traditional black and blue. After World War II, when the Fascists had fallen from power, the club reverted to their original name and colours. In 2008, Inter celebrated their centenary with a red cross on their away shirt. The cross is reminiscent of the flag of their city, and they continue to use the pattern on their third kit. In 2014, the club adopted a predominantly black home kit with thin blue pinstripes before returning to a more traditional design the following season. Animals are often used to represent football clubs in Italy – the grass snake, called Biscione or Serpente, represents Inter. The snake is an important symbol for the city of Milan, appearing often in Milanese heraldry as a coiled viper with a man in its jaws. The symbol is famous for its presence on the coat of arms of the House of Sforza (which ruled over Italy from Milan during the Renaissance period), the city of Milan, the historical Duchy of Milan (a 400-year state of the Holy Roman Empire) and Insubria (a historical region the city of Milan falls within). For the 2010–11 season, Inter's away kit featured the serpent. The team's stadium is the 80,018 seat San Siro, officially known as the Stadio Giuseppe Meazza after the former player who represented both Milan and Inter. The more commonly used name, San Siro, is the name of the district where it is located. San Siro has been the home of Milan since 1926, when it was privately built by funding from Milan's chairman at the time, Piero Pirelli. Construction was performed by 120 workers, and took 13 and a half months to complete. The stadium was owned by the club until it was sold to the city council in 1935, and since 1947 it has been shared with Inter, when they were accepted as joint tenant. Inter's most vocal fans are known to gather in the Curva Nord, or north curve of the San Siro. This longstanding tradition has led to the Curva Nord being synonymous with the club's most die-hard supporters, who unfurl banners and wave flags in support of their team. The other most significant rivalry is with Juventus; the two participate in the Derby d'Italia. Up until the 2006 Italian football scandal, which saw Juventus relegated, the two were the only Italian clubs to have never played below Serie A. In recent years, post-Calciopoli, Inter have developed a rivalry with Roma, having finished runners-up to Inter in all but one of Inter's five Scudetto-winning seasons between 2005 and 2010. The two sides have also contested in five Coppa Italia finals and four Supercoppa Italiana finals since 2006. Other clubs, like Atalanta and Napoli, are also considered amongst their rivals. Their supporters collectively go by Interisti, or Nerazzurri. Inter have won 30 domestic trophies, including the league 18 times, the Coppa Italia seven and the Supercoppa Italiana five. From 2006 to 2010, the club won five successive league titles, equalling the all-time record before 2017, when Juventus won the sixth successive league title. They have won the Champions League three times: two back-to-back in 1964 and 1965 and then another in 2010; the last completed an unprecedented Italian treble with the Coppa Italia and the Scudetto. The club has also won three UEFA Cups, two Intercontinental Cups and one FIFA Club World Cup. Javier Zanetti holds the records for both total appearances and Serie A appearances for Inter, with 858 official games played in total and 618 in Serie A.
Giacinto Facchetti, left back, 1960–1978 (posthumous honour). The number was retired on 8 September 2006. The last player to wear the shirt was Argentinian center back Nicolás Burdisso, who took on the number 16 shirt for the rest of the season. Javier Zanetti, defensive midfielder, played 858 games for Inter between 1995 and his retirement in the summer of 2014. Club chairman Erick Thohir confirmed that Zanetti's number 4 was to be retired out of respect. Below is a list of Inter chairmen from 1908 until the present day. Right before the takeover of Thohir, the consolidated balance sheets of "Internazionale Holding S.r.l." showed the whole companies group had a bank debt of €157 million, including the bank debt of a subsidiary "Inter Brand Srl", as well as the club itself, to Istituto per il Credito Sportivo (ICS), for €15.674 million on the balance sheet at end of 2012–13 financial year. In 2006 Inter sold its brand to the new subsidiary, "Inter Brand S.r.l. ", a special purpose entity with a shares capital of €40 million, for €158 million (the deal made Internazionale make a net loss of just €31 million in a separate financial statement). At the same time the subsidiary secured a €120 million loan from Banca Antonveneta, which would be repaid in installments until 30 June 2016; La Repubblica described the deal as "doping". In September 2011 Inter secured a loan from ICS by factoring the sponsorship of Pirelli of 2012–13 and 2013–14 season, for €24.8 million, in an interest rate of 3 months Euribor + 1.95% spread. In June 2014 new Inter Group secured €230 million loan from Goldman Sachs and UniCredit at a new interest rate of 3 months Euribor + 5.5% spread, as well as setting up a new subsidiary to be the debt carrier: "Inter Media and Communication S.r.l.". €200 million of which would be utilized in debt refinancing of the group. The €230million loan, €1 million (plus interests) would be due on 30 June 2015, €45 million (plus interests) would be repaid in 15 installments from 30 September 2015 to 31 March 2019, as well as €184 million (plus interests) would be due on 30 June 2019. In ownership side, the Hong Kong-based International Sports Capital HK Limited, had pledged the shares of Italy-based International Sports Capital S.p.A. (the direct holding company of Inter) to CPPIB Credit Investments for €170 million in 2015, at an interest rate of 8% p.a (due March 2018) to 15% p.a. (due March 2020). ISC repaid the notes on 1 July 2016 after they sold part of the shares of Inter to Suning Holdings Group. However, in the late 2016 the shares of ISC S.p.A. was pledged again by ISC HK to private equity funds of OCP Asia for US$80 million. In December 2017, the club also refinanced its debt of €300 million, by issuing corporate bond to the market, via Goldman Sachs as the bookkeeper, for an interest rate of 4.875% p.a. 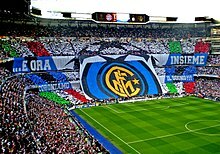 Considering revenue alone, Inter surpassed city rivals in Deloitte Football Money League for the first time, in the 2008–09 season, to rank in 9th place, one place behind Juventus in 8th place. (Milan in 10th place.) In the 2009–10 season, Inter remained in 9th place, surpassing Juventus (10th) but Milan re-took the leading role as the 7th. Inter became the 8th in 2010–11, but was still one place behind Milan. Since 2011, Inter fell to 11th in 2011–12, 15th in 2012–13, 17th in 2013–14, 19th in 2014–15 and 2015–16 season. In 2016–17 season, Inter was ranked 15th in the Money League. In 2010 Football Money League (2008–09 season), the normalized revenue of €196.5 million were divided up between matchday (14%, €28.2 million), broadcasting (59%, €115.7 million, +7%, +€8 million) and commercial (27%, €52.6 million, +43%). Kit sponsors Nike and Pirelli contributed €18.1 million and €9.3 million respectively to commercial revenues, while broadcasting revenues were boosted €1.6 million (6%) by Champions League distribution. Deloitte expressed the idea that issues in Italian football, particularly matchday revenue issues were holding Inter back compared to other European giants, and developing their own stadia would result in Serie A clubs being more competitive on the world stage. In 2009–10 season the revenue of Inter was boosted by the sales of Ibrahimović, the treble and the release clause of coach José Mourinho. According to the normalized figures by Deloitte in their 2011 Football Money League, in 2009–10 season, the revenue had increased €28.3 million (14%) to €224.8 million. The ratio of matchday, broadcasting and commercial in the adjusted figures was 17%:62%:21%. For the 2010–11 season, Serie A clubs started negotiating club TV rights collectively rather than individually. This was predicted to result in lower broadcasting revenues for big clubs such as Juventus and Inter, with smaller clubs gaining from the loss. Eventually the result included an extraordinary income of €13 million from RAI. In 2012 Football Money League (2010–11 season), the normalized revenue was €211.4 million. The ratio of matchday, broadcasting and commercial in the adjusted figures was 16%:58%:26%. However, combining revenue and cost, in the 2006–07 season they had a net loss of €206 million (€112 million extraordinary basis, due to the abolition of non-standard accounting practice of the special amortization fund), followed by a net loss of €148 million in the 2007–08 season, a net loss of €154 million in 2008–09 season, a net loss of €69 million in the 2009–10 season, a net loss of €87 million in the 2010–11 season, a net loss of €77 million in the 2011–12 season, a net loss of €80 million in 2012–13 season and a net profit of €33 million in 2013–14 season, due to special income from the establishment of subsidiary Inter Media and Communication. All aforementioned figures were in separate financial statement. Figures from consolidated financial statement were announced since 2014–15 season, which were net losses of €140.4 million (2014–15), €59.6 million (2015–16 season, before 2017 restatement) and €24.6 million (2016–17). In 2015 Inter and Roma were the only two Italian clubs that were sanctioned by the UEFA due to their breaking of UEFA Financial Fair Play Regulations, which was followed by Milan which was once barred from returning to European competition in 2018. As a probation to avoid further sanction, Inter agreed to have a three-year aggregate break-even from 2015 to 2018, with the 2015–16 season being allowed to have a net loss of a maximum of €30 million, followed by break-even in the 2016–17 season and onwards. Inter was also fined €6 million plus an additional €14 million in probation. Inter also made a financial trick in the transfer market in mid-2015, in which Stevan Jovetić and Miranda were signed by Inter on temporary deals plus an obligation to sign outright in 2017, making their cost less in the loan period. Moreover, despite heavily investing in new signings, namely Geoffrey Kondogbia and Ivan Perišić that potentially increased the cost in amortization, Inter also sold Mateo Kovačić for €29 million, making a windfall profit. In November 2018, documents from Football Leaks further revealed that the loan signings such as Xherdan Shaqiri in January 2015, was in fact had inevitable conditions to trigger the outright purchase. On 21 April 2017, Inter announced that their net loss (FFP adjusted) of 2015–16 season was within the allowable limit of €30 million. However, on the same day UEFA also announced that the reduction of squad size of Inter in European competitions would not be lifted yet, due to partial fulfilment of the targets in the settlement agreement. Same announcement was made by UEFA in June 2018, based on Inter's 2016–17 season financial result. ^ Ranking of European teams supporters: Barcelona first with 57.8 million, followed by Real Madrid (31.3 million), Manchester United (30.6 million), Chelsea (21.4 million), Bayern Munich (20.7 million) and Inter (18.4 million). ^ "FC Internazionale Milano S.p.A." Financial Times. Retrieved 13 June 2018. ^ "Suning Holdings Group acquires majority stake of FC Internazionale Milano S.p.A." inter.it. Retrieved 6 June 2016. ^ "Inter, Suning si prende il 68,55%, Moratti lascia dopo 21 anni". gazzetta.it (in Italian). Retrieved 6 June 2016. ^ "LionRock Capital acquires 31.05% of FC Internazionale Milano S.p.A." inter.it. Retrieved 25 January 2019. ^ a b "Annual Report 2015" (PDF). Pirelli. 2016. Retrieved 14 June 2016. ^ List of shareholders on 30 June 2016, document purchased from Italian C.C.I.A.A. ^ "Steven Zhang named President of FC Internazionale Milano S.p.A." inter.it. Retrieved 26 October 2018. ^ "Inter Milan arrives in Jakarta to prepare for two friendlies". The Jakarta Post. 24 May 2012. Retrieved 25 July 2013. ^ Grove, Daryl (22 December 2014). "10 Soccer Things You Might Be Saying Incorrectly". Paste. Retrieved 21 June 2017. ^ a b "Inter join exclusive treble club". uefa.com. Retrieved 9 August 2012. ^ "Struttura" (in Italian). San Siro. Archived from the original on 12 June 2010. Retrieved 4 October 2010. ^ "Italia, il paese nel pallone" (PDF). demos.it (in Italian). 24 September 2010. pp. 3, 9–10. Retrieved 20 July 2011. ^ "Tifo: Barcellona la regina d'Europa" (in Italian). Sport Mediaset. 9 September 2010. Retrieved 10 September 2010. ^ "Calcio, Barcellona club con più tifosi in Europa, Inter 8/a". La Repubblica (in Italian). Italy. 9 September 2010. Retrieved 10 September 2010. ^ "The World's Most Valuable Soccer Teams". Forbes. 17 April 2013. Retrieved 13 July 2013. ^ "Qualcosa di speciale? La patch 105". inter.it (in Italian). ^ "Storia". FC Internazionale Milano. Retrieved 6 September 2007. ^ "Helenio Herrera: More than just catenaccio". www.fifa.com. FIFA. Retrieved 10 September 2014. ^ "Mazzola: Inter is my second family". FIFA. Retrieved 11 September 2014. ^ "La leggenda della Grande Inter" [The legend of the Grande Inter] (in Italian). Inter.it. Archived from the original on 19 October 2012. Retrieved 10 September 2014. ^ "La Grande Inter: Helenio Herrera (1910–1997) – "Il Mago"" (in Italian). Sempre Inter. Retrieved 10 September 2014. ^ Fox, Norman (11 November 1997). "Obituary: Helenio Herrera – Obituaries, News". The Independent. UK. Retrieved 22 April 2011. ^ Smyth, Rob (17 September 2016). "Ronaldo at 40: Il Fenomeno's legacy as greatest ever No 9, despite dodgy knees". The Guardian. Retrieved 7 September 2018. ^ Andersson, Astrid (23 April 2007). "Materazzi secures early title for Inter". The Daily Telegraph. Retrieved 23 April 2014. ^ "FC Internazionale Milano statement". FC Internazionale Milano. 29 May 2008. Retrieved 29 May 2008. ^ "Nuovo allenatore: Josè Mourinho all'Inter" (in Italian). FC Internazionale Milano. 2 June 2008. Retrieved 2 June 2008. ^ "Bayern Munich 0–2 Inter Milan". BBC Sport. 22 May 2010. Retrieved 24 May 2010. ^ "Jose Mourinho's Treble-chasing Inter Milan win Serie A". BBC Sport. 16 May 2010. Retrieved 24 May 2010. ^ "Mourinho unveiled as boss of Real". BBC Sport. 31 May 2010. ^ "TP Mazembe 0–3 Internazionale". ESPN Soccernet. 18 December 2010. Archived from the original on 22 December 2010. Retrieved 18 December 2010. ^ "Inter and Benitez separate by mutual agreement". inter.it. 23 December 2010. ^ "Press release: Internazionale Holding S.r.l". FC Internazionale Milano. 1 August 2012. Retrieved 5 June 2015. ^ a b c FC Internazionale Milano S.p.A. bilancio (financial report and accounts) on 30 June 2013, PDF purchased from Italian C.C.I.A.A. ^ "FC Internazionale Milano statement". FC Internazionale Milano. 15 November 2013. Retrieved 5 June 2015. ^ "FC Internazionale Milano S.p.A. signs an agreement to open capital to new investors". FC Internazionale Milano. 15 October 2013. Retrieved 6 June 2015. ^ a b FC Internazionale Milano S.p.A. bilancio (financial report and accounts) on 30 June 2014, PDF purchased from Italian C.C.I.A.A. ^ "FC Internazionale Milano and D.C. United announce collaborative agreement". FC Internazionale Milano. 2 December 2013. Retrieved 6 June 2015. ^ "Suning Holdings Group acquires majority stake of FC Internazionale Milano S.p.A." FC Internazionale Milano. 6 June 2016. Retrieved 6 June 2016. ^ "China's Suning buying majority stake in Inter Milan for $307 million". Reuters. 5 June 2016. Retrieved 24 July 2017. ^ "Assemblea degli Azionisti di FC Internazionale Milano" [FC Internazionale Milano Shareholders' Meeting] (Press release). FC Internazionale Milano. 28 June 2017. Retrieved 11 July 2017. ^ "FC Internazionale Milano statement". ^ (in Italian) Stefano Scacchi (9 December 2016). "Eder per l'inutile successo dell'Inter passa la sorpresa Hapoel Be'er Sheva". la Repubblica. p. 44. ^ "Steven Zhang named President of FC Internazionale Milano S.p.A." inter.it. 26 October 2018. Retrieved 26 October 2018. ^ "LionRock Capital Acquires 31.05% of FC Internazionale Milano S.p.A." (Press release). F.C. Internazionale. Retrieved 26 January 2019. ^ "Nerazzurri rebranding: new logo, same Inter". Inter.it. ^ "Inter rebranding in detail". Inter.it. ^ "9 marzo 1908, 43 milanisti fondano l'Inter". ViviMilano.it. 24 June 2007. ^ a b c "AC Milan vs. Inter Milan". FootballDerbies.com. 25 July 2007. ^ "Emeroteca Coni". Emeroteca.coni.it. Retrieved 7 January 2013. ^ "Ambrosiana S.S 1928". Toffs.com. 24 June 2007. ^ "Mauro Icardi models Inter Milan's new pinstripe 2014–15 home kit". Daily Mail. 9 July 2014. ^ "Research: Supporters of football clubs in Italy". La Repubblica (in Italian). August 2007. ^ "INTER: gli Ultras avversari – Rangers 1976 Empoli Ultras". Rangers.it. Retrieved 7 January 2013. ^ "INTERISTI". FC Internazionale Milano. Retrieved 22 September 2015. ^ "record holders". inter.it. Retrieved 8 March 2013. ^ "Prima Squadra" (in Italian). FC Internazionale Milano. January 2018 [circa]. Retrieved 4 January 2018. ^ "GIORDANO BARDEGGIA È GRANATA" (in Italian). Reggio Audace. 28 August 2018. ^ "Internazionale retire No4 shirt in honour of Javier Zanett". The Guardian.com. 30 June 2014. ^ "Inter make Zanetti vice-president and retire No.4 jersey". Goal.com. 30 June 2014. ^ "Technical staff". inter.it. Retrieved 3 November 2017. ^ "i presidenti" (in Italian). inter.it. Retrieved 27 February 2013. ^ "Moratti, 40 milioni per coprire il buco". La Gazzetta dello Sport (in Italian). 9 October 2011. Retrieved 8 April 2018. ^ "Why are Russians oiling the wheels of football?". Financial Times. 22 October 2005. Retrieved 8 April 2018. ^ Morrow, Stephen (2003). The People's Game? : Football, Finance and Society. Palgrave Macmillan. pp. 120–123. Retrieved 8 April 2018. ^ Calzada, Esteve (2013). Show Me the Money! : How to Make Money Through Sports Marketing. Bloomsbury Publishing. p. 10. Retrieved 8 April 2018. ^ "Annual Report 2006" (PDF). Pirelli & C. S.p.A. 31 May 2007. Archived from the original (PDF) on 24 January 2013. Retrieved 20 January 2016. ^ "Assemblea Straordinaria: comunicato ufficiale" (in Italian). FC Internazionale Milano. 22 June 2007. Retrieved 21 January 2016. ^ a b "Assemblea dei Soci: approvato il bilancio" (in Italian). FC Internazionale Milano. 27 December 2007. Retrieved 5 August 2011. ^ a b "Assemblea Soci Inter: approvato il bilancio" (in Italian). FC Internazionale Milano. 26 October 2009. Retrieved 5 August 2011. ^ a b "Assemblea Soci Inter: ricavi, oltre 300 milioni" (in Italian). Milan: FC Internazionale Milano. 28 October 2010. Retrieved 5 August 2011. ^ a b "Assemblea Soci Inter: approvato il bilancio" (in Italian). FC Internazionale Milano. 28 October 2011. Retrieved 22 February 2012. ^ "Assemblea Soci Inter: approvato il bilancio" (in Italian). FC Internazionale Milano. 29 October 2012. Retrieved 20 January 2016. ^ Internazionale Holding S.r.l. bilancio (financial report and accounts) on 30 June 2013 (in Italian), PDF purchased from C.C.I.A.A. ^ "Assemblea: Massimo Moratti Presidente" (in Italian). FC Internazionale Milano. 6 November 2006. Retrieved 23 January 2016. ^ "All'Inter il primato del deficit: 181,5 milioni". Il Sole 24 Ore (in Italian). 10 January 2007. Retrieved 22 January 2016. ^ "Il "doping" nei conti dei big del pallone perdite complessive oltre i 68 milioni". La Repubblica (in Italian). 9 November 2006. Retrieved 8 April 2018. ^ "Refinancing 230 million euro of Inter Milan debt". nikkei Asian Review. 26 June 2014. Retrieved 8 April 2018. ^ "Inter, la rivoluzione di Thohir passa da un'operazione di ingegneria finanziaria. Ma il club si gioca tutto in 5 anni". il sole 24 ore (in Italian). 2 May 2014. Retrieved 8 April 2018. ^ "Inter, buchi in bilancio e tiri Mancini". L'Espresso (in Italian). 21 November 2014. Retrieved 8 April 2018. ^ "Thohir, prestito di 80 mln dando in pegno la società con le azioni Inter". Calcio e Finanza (in Italian). 27 January 2017. Retrieved 14 November 2017. ^ "Inter lancia Media Bond garantito" (in Italian). ANSA. 11 December 2017. Retrieved 12 December 2017. ^ Bellinazzo, Marco (11 December 2017). "L'Inter punta a ristrutturare i debiti fino al 2022: lanciato un prestito obbligazionario da 300 milioni". Calcio & business blog. il Sole 24 Ore (in Italian). Retrieved 12 December 2017. ^ "[no title]" (Press release) (in Italian). FC Internazionale Milano. 14 December 2017. Retrieved 15 December 2017. ^ "Real Madrid becomes the first sports team in the world to generate €400m in revenues as it tops Deloitte Football Money League". Deloitte. Archived from the original on 5 August 2010. Retrieved 7 January 2013. ^ a b The untouchables Football Money League (PDF). Sports Business Group. Deloitte. February 2011. Archived from the original (PDF) on 25 November 2011. Retrieved 6 November 2018. ^ a b Fan power Football Money League (PDF). Sports Business Group. Deloitte. February 2012. p. 18. Archived from the original (PDF) on 15 October 2014. Retrieved 6 November 2018. ^ Top of the table Football Money League (PDF). Sports Business Group. Deloitte. January 2016. p. 34. Retrieved 6 November 2018. ^ Planet Football Football Money League (PDF). Sports Business Group. Deloitte. January 2017. p. 38. Retrieved 6 November 2018. ^ Rising stars Football Money League (PDF). Sports Business Group. Deloitte. January 2018. p. 40. Retrieved 6 November 2018. ^ a b c "Spanish Masters Football Money League" (PDF). Sports Business Group. Deloitte. March 2010. p. 15. Archived from the original (PDF) on 11 May 2013. Retrieved 7 January 2013. ^ a b "Premier League v Serie A: TV money". BBC Sport. 21 February 2009. Retrieved 6 November 2018. ^ FC Internazionale Milano S.p.A. bilancio (financial report and accounts) on 30 June 2007 (in Italian), PDF purchased from C.C.I.A.A. ^ "Inter, 87 milioni di perdite ora si fa dura col fair play". La Gazzetta dello Sport (in Italian). Milan. 29 October 2011. Retrieved 6 November 2018. ^ "Inter: buco di 103 milioni, sanzione Uefa in arrivo. Thohir: "2-3 anni per risanare"". La Gazzetta dello Sport (in Italian). Milan. 20 October 2014. Retrieved 6 November 2018. E nel bilancio ratificato oggi è stata resa nota un'operazione straordinaria infragruppo che ha coinvolto la capogruppo e le controllate Inter Brand e Inter Media: per questo motivo nel bilancio di Fc Internazionale risulta un utile di 33 milioni di euro. ^ "Inter, perdita consolidata di 140,4 milioni. Bisogna puntare alla Champions". La Gazzetta dello Sport (in Italian). 20 October 2015. Retrieved 8 April 2018. ^ a b FC Internazionale Milano S.p.A. bilancio consolidato 2016-06-30 (in Italian). Italian C.C.I.A.A. 2016. ^ "Inter, rosso giù a 60 milioni, ma nuovo maxi-prestito dalle banche di 300". La Gazzetta dello Sport (in Italian). Milan. 29 October 2016. Retrieved 6 November 2018. ^ a b FC Internazionale Milano S.p.A. bilancio consolidato 2017-06-30 (in Italian). Italian C.C.I.A.A. 2017. ^ "Inter, S. Zhang: "Meritiamo l'Europa. Ringrazio Spalletti per il grande lavoro"". La Gazzetta dello Sport (in Italian). Milan. 27 October 2017. Retrieved 6 November 2018. ^ a b "Settlement agreements: details". UEFA. 8 May 2015. Retrieved 16 January 2016. ^ a b FC Internazionale Milano S.p.A. bilancio 2015-06-30 (in Italian). Italian C.C.I.A.A. 2015. ^ "Inter by-passed FFP on Shaqiri". Football Italia. London. 4 November 2018. Retrieved 6 November 2018. ^ "Inter achieves UEFA break-even target for 2016/17". FC Internazionale Milano. 21 April 2017. Retrieved 22 April 2017. ^ "Three clubs exit settlement agreement with CFCB". UEFA. 21 April 2017. Retrieved 22 April 2017. ^ "Comunicato di FC Internazionale Milano". inter.it (Press release) (in Italian). FC Internazionale Milano. 20 December 2016. Retrieved 15 July 2017.